The leading independent specialist for windscreen replacement and windscreen repair based in Brighton and serving all of the Brighton area. National Windscreens Brighton fitting centre provides windscreen replacement and windscreen repair services to businesses and individuals throughout Brighton and the Brighton area. The city of Brighton is on the south coast of England, situated adjacent to the small seaside town of Hove. The A27 and A23 provide transport links into the city, with the M23 not too far north allowing access to London reasonably easily. The city centre is now pedestrianised after the redevelopment of George Street in the late 1990’s. There are many iconic tourist attractions as well as the beautiful beachfront. The city is a vibrant, colourful, fun place to be. 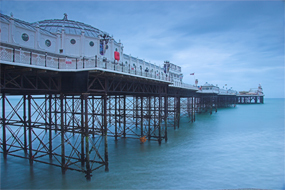 The Brighton windscreen fitting centre and its mobile vehicle glass technicians service the needs of Brighton and the surrounding area including Hove, Worthing, Shoreham-by-sea and Newhaven. With 108 fitting centres and over 800 mobile technicians, National Windscreens operates the UK's largest windscreen repair and windscreen replacement network. The company provides low cost, high quality windscreen replacement and windscreen repair from its Brighton fitting centre 24 hours a day, 7 days a week, 365 days a year. Repair and replacement of all types of vehicle glass including windscreens, rear windows and side windows is undertaken throughout Brighton and all of the Brighton area.